The national diets of some countries contain a nutrient that keeps their citizens healthy — and can teach us a thing or two. Singapore’s cuisine may be something to shout about with its plethora of savoury dishes influenced by Malay, Chinese, Indian, Indonesian and Portuguese cultures. But as a national diet, our delicious but fattening nasi lemak, char kway teow, roti prata and laksa dishes are not so good for our waistlines, cholesterol levels and overall health. Yet certain national diets have a lot of fat, too, but are considered to be nutritious as they contain a specific fat that is beneficial for our health. So which national diets should we look to? Japanese cuisine is known for its multitude of fresh fish options. From maguro (tuna) sashimi to grilled saba (mackerel) to salmon bentos, these fish dishes give those who live in Japan a good dose of omega-3 fatty acids. This polyunsaturated fat makes our blood clot less easily, decreasing the risk of strokes. Omega-3 also lowers the levels of a type of cholesterol called low-density lipoprotein (LDL) in our bodies, where elevated levels are a risk factor for heart diseases. As such, Japan’s omega-3-filled diet is known as heart-healthy. The Mediterranean diet is rich in Omega-3 too and can be found in foods such as salmon, trout and whole grains.The Mediterranean diet is also given a leg up with its emphasis on high-fibre vegetables and olive oil, which reduces LDL cholesterol levels. But even if you would like to make your diet a little more Japanese or Italian, you do not have to constantly eat only salmon cooked with olive oil. Your local market and supermarket sell an array of food items that are sources of omega-3 such as sardines, mackerel, herring, tuna and walnuts, Brazil nuts, cauliflower and flaxseeds. 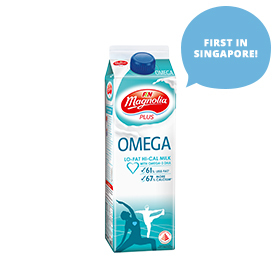 Nutritious products that contain DHA, which the whole family can consume, is also available, such as milk fortified with DHA, an essential Omega-3 fatty acid. These make it easy for you to include in recipes when making meals, such as chocolate pancakes and red velvet pancakes with cream cheese glaze, which the family is sure to enjoy.